My son Craig decided to check out the Tricos hatch off Quarry road yesterday and see if fish were rising. His report was that there are plenty of Tricos and pods of fish eating them. Over 100 yards upstream he broke off on what he thought was a decent sized fish. Therein is the beginning of my fish story. I decided to go back there today. After 3 phone calls to Craig, I found the exact tree where he found some rising fish and also where he broke off…..and a few fish rising just like he said. As it frequently happens on the heritage section of the Falling Spring, the fish shut down after several casts….. even with 12 feet of leader tied down to 7X and a size 28 gray hackle midge. So, I waited. Finally, another rise and I was back in business. 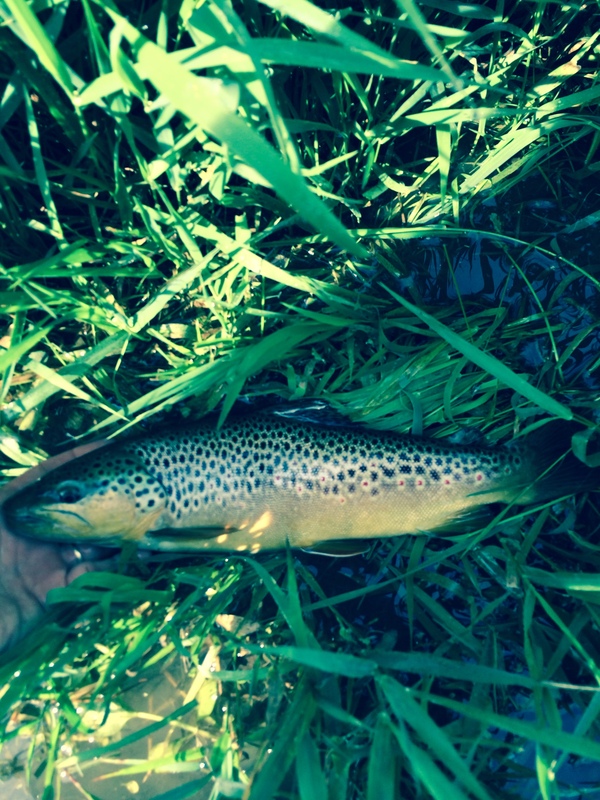 This time, a 16″ Brown cooperated. Now the rest of the story. After guiding the fish closer to the bank so I could get a quick picture, I dug out “my fly” and dropped the fly attached to my hemostats with leader attached in the water so I could release the fish. To my amazement, the fish started swimming away but still attached to the leader on my fly rod. This time I removed MY FLY. Craig’s fly and leader was the first one removed. I stung one other fish later in the am but left with one good story. Thanks to Craig!